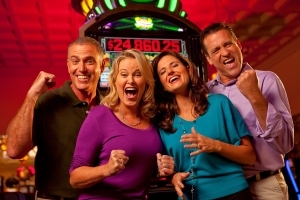 Bingo and Keno are regularly offered by casinos. They are similar games but have different playing methods. There are two strains of bingo that a player can play: Commonwealth bingo and US Bingo. This form of bingo is normally associated with European players. The game is played by marking numbers that are randomly drawn by a caller. European bingo is played with 90 numbers. The game is played by a person who purchases a book of tickets. Each book contains six tickets. Every ticket has 27 squares arranged in three lines and 9 columns. Each ticket has 15 numbers and 12 blanks arranged as five numbers and four blanks on each line. The player must mark off each number called until the last number is marked. The player must then shout house. The ticket is verified and the win is awarded. Take a look at William Hill online bingo to get the general idea about how the game is played. This is an American variation of bingo. It is played using 75 numbers. The ticket has 5 columns and contains 24 numbers. The central square is always left blank. The game is then played in the same manner as Commonwealth bingo. The game of Keno is controlled by two people aptly named the caller and the verifier. The equipment required to play Keno is a glass or see through container which contains 80 numbered balls. This is called the “bubble”. The sequence of numbers on the balls runs consecutively from 1 through to 80. The balls are agitated by a blower which introduces a stream of air into the bubble to circulate them. ers 1 to 80 listed in numbered selection sites. A player chooses 20 numbers and marks an S over each of their choices. This is then electronically scanned into the Keno computer system. The player pays his entry fee and waits for the game to commence. The caller draws 20 random balls from the bubble, one at a time. As each ball is drawn the caller states to the players the number on the ball. These are then checked by the verifier and subsequently recorded. Once the 20 balls have been drawn, their respective numbers are entered into the Keno computer and it then calculates the winning tickets that have been scanned and the winner can collect their rewards.